Bui shares her fear that she will “pass along some gene for sorrow.” Then she creates a space for readers to see the hope that comes with the birth of a child. She allows readers to accompany her on her journey to assimilation, love, and parenthood. Bui never tells us what we should think about her life; instead, she makes us a part of her passage. Bui uses humor with a deft hand. When her father, Bô, arrives in the U.S., a volunteer from U.S. Catholic Charities drives him from Chicago’s O’Hare Airport to his family in nearby Hammond, Indiana. A panel shows the two sitting on the expressway as Bô gazes out and asks “Why is it so ugly here?” Bui’s illustration of winter’s exposure of the industrial Midwest is apt as is her panel of the Hammond home where her family first lived in the U.S. Bui captures the stark reality of barren trees and snow-covered sidewalks alongside small houses set inside chain link fences that encompasses much of Hammond and industrial cities like it. Her single panel shows how immigrants arriving from tropical climes might feel when seeing dirty snow and no vegetation. Summing it Up: Thi Bui’s arresting images and her clear words offer a portrait of motherhood and of the price we all pay for war. 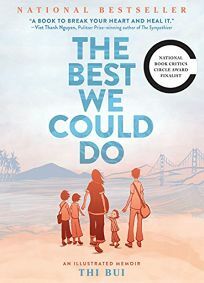 The Best We Could Do is a powerful meditation on finding meaning in the life we’ve been given. Everyone should read this book and share it. Prospective readers should visit the publisher’s site to inhale Bui’s powerful two-color images. Note: The Best We Could Do is adult nonfiction, but if I were teaching the Viet Nam War to students ages 14 and older, I’d make this my text. Lillian Boxfish Takes a Walk is set primarily on New Year’s Eve in 1984 when 85-year-old Lillian ambles through the streets of Manhattan remembering her exceptional life. The novel captures the delightfully wry disdain expressed by this notable woman who was ahead of her time in the 1920s and 30s. With its charming reminiscences of the period between 1926 and 1984, the novel feels like a romp led by Dorothy Parker and Forrest Gump. When Lillian moves to New York after college, she lands a job in R.H. Macy’s advertising department. Lillian has no desire for marriage but falls for Max, Macy’s head rug buyer, and soon finds herself unemployed because she’s given birth to their son. A marital rift and her inability to work lead to Lillian’s mental breakdown all of which she remembers as she strolls the city streets so many years later. She visits her favorite restaurant, walks on to Delmonico’s where her marriage ended, helps a pregnant woman into the Emergency Room, learns from an immigrant working in a bodega, attends a trendy party given by a young artist friend in a dangerous area, and has a humorous encounter with three muggers. Some of her adventures defy belief, yet the author’s skilled writing and Lillian’s joie de vivre help the reader accept them. Poet and writer Rooney took her inspiration for Lillian Boxfish from another poet and writer, Margaret Fishback who was supposedly the world's highest-paid female advertising copywriter in the 1930s. One of the joys of reading Lillian Boxfish Takes a Walk is that the novel makes the reader yearn to learn more about Margaret Fishback (while imposing phrases like “yearn to learn” upon the brain). Fishback wrote attention-grabbing ads for R.H. Macy’s and published poems in the leading magazines of the day. This is a day when I covered no ground. Then shuffled my papers around again. Find more of her poems and her biography here. 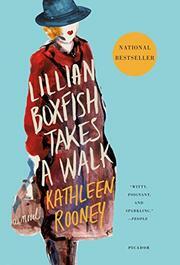 Summing it Up: Lillian Boxfish Takes a Walk is a love letter to perambulating and words. It delivers you to another time and place where you feel that you’re walking alongside Lillian. It makes you want to jump up from your perch to take a stroll of your own to embed Kathleen Rooney’s lovely phrases into your consciousness. Reading The Hearts of Men feels like sitting around a campfire listening to stories that warm both the heart and the soul. Beginning in 1962 at a northern Wisconsin boy scout camp, it envelops the reader in the life of thirteen-year-old Nelson. Thus, Nickolas Butler introduces us to Nelson and places us nervously at his thirteenth birthday party in his backyard awaiting his fellow boy scouts arrival while knowing that they won’t come. Then “Miracle of miracles! Jonathan Quick, Life-Class Scout, fifteen years old, and already six feet tall. Varsity swimmer, junior varsity starting tailback, junior varsity backup shortstop, member of the glee club and the model railroaders” arrives. Jonathan’s appearance signals something different about this novel; it introduces kindness and the idea that old-fashioned honor will make this a singularly unique novel tracing the lives of Nelson and Jonathan and those they encounter. The summer of 1962 at Camp Chippewa looks to be a Lord of the Flies rehash with the lowering of Nelson into the depths of a dark latrine to repay a debt only he was destined to settle, but what emerges is a tender tale of boys becoming men. Carrying a talisman from that venture, Nelson becomes something of a hero and the plot echoes a chorus of light emerging from darkness. As the years follow with Nelson adrift after Viet Nam and Jonathan building a profitable business, Jonathan’s son’s and grandson’s summers at Camp Chippewa anchor a tale of promises kept and those not honored. Novels celebrating goodness triumphing over evil are common, but those showing the arc of what it takes to be good in the face of evil are rare. The Hearts of Men celebrates two distinct virtues – honor and fidelity. As I pondered the novel’s characters taking root in my heart, I wondered if honor and fidelity were the correct words to describe what Butler lays out for his readers. I grabbed my trusty, hardback Roget’s and found the words fidelity, faithfulness, loyalty, constancy, steadfastness, truth, and allegiance – all words that express exactly what the boys, men, and women of this novel embody. When The Hearts of Men ventures into the present day and Jonathan’s grandson and daughter-in-law join the aging Nelson, now the camp’s celebrated director, at a camp that no longer seems equipped to address boys more attached to their screens than to the world around them, the climax fully demonstrates that honor and fidelity are timeless and universal. A sentence from the novel’s epigraph, “Where no one meant the promises they made” portends tragedy, yet the promise of love and light that Butler’s characters’ actions have built offers the reader hope and perhaps even redemption. Summing It Up: Fall into The Hearts of Men to experience a joyful, wry tale of vulnerable characters who will inhabit your heart with their strengths and weaknesses to tell you why keeping promises is the route to becoming a good person. I adored Butler’s first novel, Shotgun Lovesongs and I’m grateful that The Hearts of Men offers more of his seemingly effortless prose and intricate plotting. One of my favorite sentences in literature is from E.B. White’s Charlotte’s Web: “It is not often that someone comes along who is a true friend and a good writer. Charlotte was both.” It is not often that a novel comes along that shows true friendship and good writing. The Hearts of Men is both. It’s a rare gem – an accessible story that pulls the reader in while exploring the universality of honor, truth, and yes, fidelity. 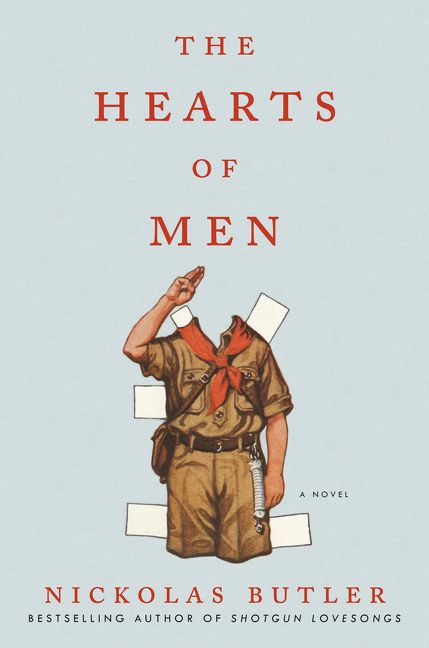 Note: Kirkus Reviews, Library Journal, and Publishers Weekly gave The Hearts of Men starred reviews and People Magazine chose it as its book of the week proving that it’s both an accessible read and fine writing. The book was first published in Europe, where it’s a finalist for the 2016 Prix Médicis Etrangere.